Why renovation ‘reality’ TV is the devil! : The dangers of armchair architects and DIY DAZZA’S. *This refers to untrained people drawing up house designs without training not furniture designers. 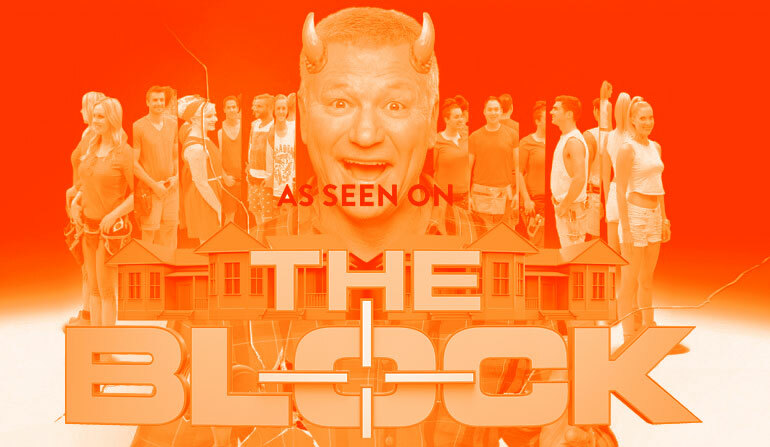 Not only do they allow Scotty Cam and Shelly (what ever her name is) to fill the airwaves with absolute pointless dribble whilst glorifying the existence of self professed ‘designers‘ and ‘power couples’ (Bazza and Bee or what ever their names are) Channel Nine’s ‘The Block’ is basically a 30-90 minute endless Bunnings Warehouse documentary, punctuated by even more actual Bunnings commercials in between, the not even remotely subtle constant product placement alone without the ads is enough to boil ones blood. On a more serious note these seemingly innocuous shows often inspire dangerous DIY practices and also diminish the value of other housing professionals such as architects and building designers. One recent Australian study found that Do it yourself (DIY) “home handy man / women” accidents were alone responsible for 20 deaths in the Australia in 2015. Television renovation shows were all the rage in 2015 it was difficult to throw a hammer and not hit a TV that wasn’t either blasting you with bathroom renovations or bedroom make overs, inspiring even the most amateur armchair architect and couch potato construction worker cowboy to fasten their new tool belt purchased with their Bunnings xmas vouchers and start some dangerous DIY. It is a scary statistic that in the state of Victoria alone, 2,000 are seriously injured each year performing DIY building work around the house ranging from: Ladder falls, acid burns, knife cuts, grinder accidents and circular saw amputations. As much as it can appear to be a cheaper option to do things around the house yourself, there are times when its advised that a professional should be employed both for your own safety and also a superior professional finish. There area also legal ramifications to performing particularly hazardous electrical work. When it comes to electricity, it’s a complete no go zone, connecting some simple looking wiring from the main house to the shed might seem fool proof but the statistics above speak for themselves – no electrical work should never be preformed on your home unless the work is performed by a Licensed Electrician or Registered Electrical Contractor (R.E.C.). At the very most you should do without the proper skills is to change a light bulb. The results of illegal DIY work, even if not shoddy in terms of appearance, can be truly dangerous not only to life and limb but also to property. House fires area a common danger faced by DIY electrical work and this technically is a loop hole for insurance companies to exploit too leaving you without cover – not really worth the risk. The media are responsible for selling the myth of easy money saving and instant YouTube acquired skills they glamorise with heavily edited footage of average suburban couples managing to transform an ugly off the shelf house in a matter of hours, bypassing council approval processes or Building codes and materialising them into luxury abodes worthy of a Pintrest page or cover page spread on the front of Queensland’s Best Houses magazine. Consumers are force fed the fallacy that these things can be achieved in 30-90 minute bite sized episodes and everyone is capable of achieving a professional looking home renovation in hours without any architectural or building training or experience, with clever lighting, camera work, smoke and mirrors the heavily edited segments, filled with equal measures or manufactured drama and canned laughter after the cliche hi-jinx and wave of a magic wand a million dollar home is born on a shoe string budget. The producers neglect to highlight the multitude of professionals used behind the scenes, the architects or building design professionals who drew up the DA plans for the home initially, who are largely un-credited and also the myriad of off camera tradesmen who train up and also finish off the final house design dangerously working through the night to complete these unrealistic time frames and in doing this they are perpetuating a dangerous lie.